Surrey Fire and Rescue Service is getting on board with the Royal National Lifeboat Institution, to help prevent people losing their lives through drowning. The initiative is backed by other Surrey emergency services and Runnymede, Spelthorne and Elmbridge borough councils. With drowning now a bigger cause of death in Surrey than accidental house fires, the fire service is adopting the lifeboat charity’s ‘Respect the Water’ campaign to raise awareness of the potential dangers of being on or near the water. The joint initiative will kick off with a free public event to promote water safety at Runnymede Pleasure Grounds on Saturday 10 June from 11am to 3pm. Firefighters, RNLI lifeboat crews and paramedics will give a series of demonstrations including water rescues and CPR and members of the public will be able to have a go themselves. There will also be a chance to climb aboard a fire engine, rescue boats and response vehicles. It is the first time the RNLI’s Respect the Water campaign has been adopted in a landlocked county. 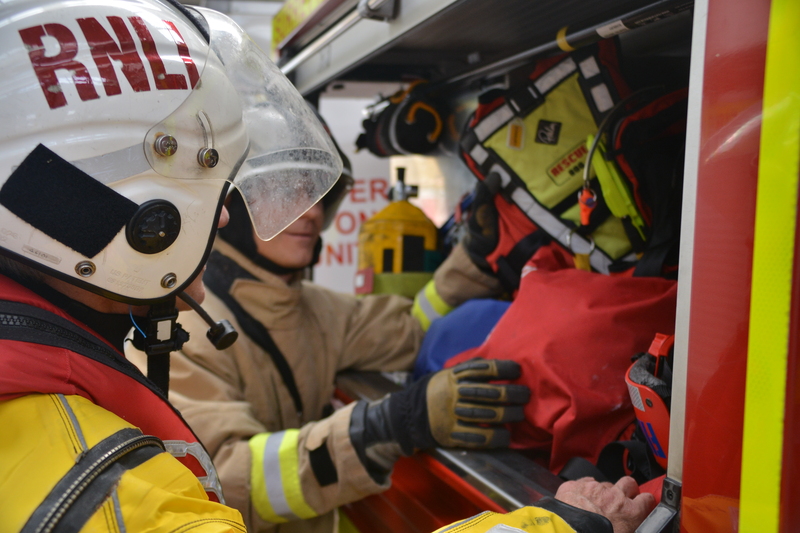 In linking up with the charity, which saves lives at sea, the fire service aims to make sure key water safety advice reaches people living near or visiting the Surrey stretch of the River Thames as well as the county’s lakes and other rivers. The initiative is supported by Runnymede, Spelthorne and Elmbridge borough councils – the three Surrey boroughs which the River Thames runs through – as well as South East Coast Ambulance Service, Surrey Police and Surrey Search and Rescue. Denise Turner-Stewart, Surrey County Council’s Cabinet Member for Communities, said: “Respect the Water is the RNLI’s campaign to prevent deaths from drowning and we’re pleased to be working with the charity to expand it to Surrey with support from other emergency services and borough councils along the Thames. Since 2010, 34 people have drowned in open water in Surrey and 33 have died in accidental house fires, according to fire service records. Guy Addington, RNLI Community Safety Partner, said: ‘The RNLI’s volunteer lifeboat crews and lifeguards saved hundreds of people from near-fatal incidents in 2016 and rescued thousands more but, sadly, they aren’t able to reach everyone. If people in danger in the water can help themselves initially by floating and regaining control of their breathing, they stand a much greater chance of surviving. Through our Respect the Water campaign, we want to start a national conversation about water safety. We’re asking the public to remember this lifesaving advice, share with others and practice the survival skill of floating – it could be the difference between life and death. The Respect the Water campaign is targeted at adult men, who account for a staggering 79% of the fatalities over the past five years in the tidal reaches of the River Thames (57% last year) although the advice is relevant to anyone who goes near the water. The Respect the Water campaign will run throughout the summer on channels including cinema, outdoor, radio, online, and on catch-up TV channels. The RNLI is asking people to visit RNLI.org/RespectTheWater where they will find information on the effects of cold water shock and floating techniques. On social media search #RespectTheWater. When you are near open water, keep away from the edge, stick to designated paths and look out for safety signs. Keep clear of uneven, unstable or slippery ground. Avoid walking alone or at night, and always carry a means of calling for help. If you find yourself in the water unexpectedly, float on your back while you catch your breath. Try to get hold of something that will help you float. Once you’re calm, call for help. Swim for safety if you are able.